I was asked if I would be willing to read and review Making a Case for Life: A New Definition of Perfection , by Stephanie Wincik. It didn't take me more than a nanosecond to decide in favor of accepting this particular review copy, being that it is a pro-life statement. Did I agree with the book? Um, yes. Did it have some surprises for me? Yes, it did. Now, a lot of people like to get together and host book clubs to discuss modern novels. There is (most certainly) nothing wrong with it, and I've participated in several myself. However, when I think of a "book club discussion" I think the best books are ones like Making a Case for Life . Why? Because you can't walk away from it and make the claim that you really have nothing to share from it. It isn't the type of book that allows you to just sit and nod your head at the other ladies in the group. You WILL have an opinion because you must. It pushes you towards making a statement. Making statements of opinion generally livens up a book club discussion right quick! That said, Making a Case for Life really isn't a book that should be contained to a book club. It should be a discussion that we have with society at large. The society that is choosing to kill their unborn is the society that needs to read this book. We are that society. Unfortunately. Before I go much further, I should tell you that the author of this book, Stephanie Wincik, RN, CDDN, is making the point in this book that we should choose life specifically for individuals with Down Syndrome. Her arguments are limited to this particular group of people who are being aborted at quite a high rate. She makes it very clear in her opening pages that she is not writing this book to debate the merits of abortion in general. (That, she says, is debatable only case-by-case.) 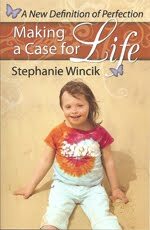 Her primary message with this book is to convince people that those with Down Syndrome are and can be productive members of society and should be given a chance at living life alongside the "normal" people. I could not agree more with that specific message. Naturally, I agree with her that babies with Down Syndrome should be granted life. As much as we may question it at times, God never makes mistakes. He created life and therefore life is sacred. Taking away someones life is murder - at any stage of the game. While I agree with her arguments in general, I also believe she used some pretty faulty logic to get there. I do think this book has the potential to excite the masses looking for a hip pro-life argument though. You should know that Wincik makes no statements in this book that she believes in God or is a Christian. She also claimed no value system or moral standard in making her arguments. Instead of saying, "God created life therefore it is inherently valuable" she says, in so many words, "We shouldn't mess with the evolutionary process and determine for ourselves what characteristics and traits are good for humans to have or not have." In other words - don't decide to abort an entire race of Down Syndrome people because perhaps they will prove to be the fittest of us all. In fact, her book concludes with a section entitled, "What Would Happen if Down Syndrome People Ruled the World" and then, of course, it talks about the inherent goodness of those with this particular physical condition. 2. "What if evolution are true and we're messing with it?" The second argument doesn't even appeal to people's consciences because today's society is all about the almighty "Now!" and what feels good in the moment. They may tout evolutionary verbiage, but I don't see evidence that the majority of people truly care. That's the problem with evolution. When everything is left to chance, what should you care about? Anything might be good and anything might be bad. Therefore I could, after hearing Wincik's argument, come to the conclusion that she might be wrong. Then I could go and justifiably, operating out of my personal truths (whatever they are!) go and abort my Down Syndrome child. Or, for that matter, I might just as well abort my "normal" child. What's to stop me? I haven't been given a truth to hold me to anything. Truth is relevant. Why should her truths matter more than mine? So, in the end, I find her book doesn't really hold a great deal of water, while at the same time it will likely give people pause. (Like I said, her arguments are kinda hip and cool!) I therefore have a mixed reaction to it. I like the message, I just don't think it's delivered with a solid foundation. In the end, I'm left standing here with a book that does little to convince me of anything other than what I already believe to be true and sacred. In the book of Job, we find Job speaking to God and in Chapter 10, verse 8 he says, "Your hands shaped me and made me." I believe that God created life and He did not give the rights away for us to remove lives through an act of murder. He maintains the right to decide when life begins and when it ends. In fact, He goes so far as to say that we are not to take away the life of an innocent one. To end a life on a whim/preference or someone's "choice" is to play God and to carry out an act that is only His to fulfill. I believe we should act justly towards the unborn - those with Down Syndrome and those without. An innocent life is not ours to take. The choice that I can see we have in the matter is whether to love and find the children to be the blessing that God intends for them to be, or to place them in the care of those will nurture them and love them appropriately on our behalf. I think images and real life stories are powerful examples of Biblical truths. Here is a picture of a baby that was born at less than 22 weeks gestation. In America today, this baby could have been aborted and likely the mother would have been told that the baby was just a "fetus." Not viable. Not alive. As you can see, this baby girl is alive. She needs help, yes, but since that's what we're called to give a human life, I've no apologies to offer anyone. Twenty-two weeks. And able to live. Developed and created by God and viable and active today. She could have been legally aborted. 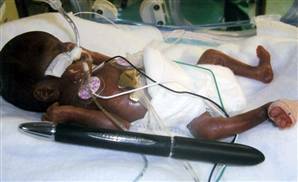 Did you catch the story just the other month where a baby boy was aborted at 22 weeks - and survived? He was abandoned and survived for TWO DAYS - ON HIS OWN! - before a priest who had come to pray over his body discovered him moving and breathing. You know. I was going to try and post a picture here of an aborted baby. I've tried to do it before and failed and I'm failing again. Why? Because he pictures make me sick to my stomach and I have to look away because the sight is too painful. If you are pro-abortion - then will you please look at those pictures? See what abortion really is. And don't leave a comment here until you look. Google images will take care of things for you. Just type in "aborted baby." Or, if you like, "aborted fetus" will work just as well. Today the main reason that parents will choose to abort their children is because their doctor has told them of some physical defect. When I was pregnant, my doctor started to tell me that I could have a test to determine whether the baby had Down Syndrome. I cut him off quickly. No matter what form my child came in, he would be MY child and I would receive him as a blessing from God. When our adoption agency asked us about our concerns over a potential health concern of our youngest son, I shut the agency down. This child was OURS. A God-given blessing. Full acceptance of the blessing that he was - and is! Both of our boys are blessings and neither of them are flawless. Oh, but then again, neither are we! Americans want - or think they want - perfect children. We forget that we ourselves are not perfect. But we aren't perfect. We're quite imperfect, actually. But God. Even though you planned evil against me, God planned good to come out of it. We can't see down the road. We must just walk in obedience to truth. If we do that, God will work all things together for our good and for His glory. (Romans 8:28) Not to say the path will be easy. It might not be easy at all! But it can be good. Let's repeat: God uses people and circumstances in our lives to change us for our own good and for His glory. Challenges and difficulties are tools He uses to make us more like Him - to make us gracious, loving, kind, patient and all of the things HE IS. Gracious and compassionate doesn't exactly define a society who kill their young. There is a truth because there is a God. He created life and He alone sustains it. He holds the right to take away lives and said we are not to murder one another. We are to protect the innocent. The Down Syndrome child and the "normal" child are both valuable and precious in God's sight. And anything that is precious in the sight of God - should be precious in our own. Wow. What a powerful post. Thank you for sharing from your heart. I enjoyed this post. I agree. I can't believe the things you said, I didn't know about alot of that. The end of the article mentioned another little boy who they attempted to abort three times but survived and is now 5 years old. There are no words... Only tears. Whew!! That must have been some book to get you going like this. :) I couldn't agree with you more. The doctors offered me all kinds of tests with all 4 of my pregnancies and I turned them all down. I didn't need to know and work myself into a frenzy for 9 months. AND - little known fact - most of those tests that come back positive are actually false positives. Which means a whole lot of people are making decisions on wrong information. Our home school co-op this year had a student with Down Syndrome. She's 10 and was in several classes with my 7 year old. Having her there opened the door for some great discussions with my guy about how people are different but we are all created by God and valuable. Her mom had concerns at the beginning of the year but after a month it was clear to see Catherine THRIVED in the co-op. She gained new independence and friends. At the end of the year I thanked her mom for allowing Catherine to attend the co-op. She is a blessing to be around. I'll get my soap box and stand on the corner with you any day! I ranted with you while I read this post! While I'm glad she's putting this perspective out there, you're right about the faulty logic. We have to lay out the pro-life viewpoint in such a way that it can't be refuted (if you accept where we start...which is the real difference).